A specialised saw designed to deliver cuts at a range of angles, this tool is perfect for both commercial and domestic use. Whether you’re a joiner or completing DIY, a Ryobi mitre saw can make quick work of tricky cutting tasks. Look through our range to find unit-only saws, as well as saw, battery and charger sets. From moulding to skirting boards, a mitre saw has a number of essential applications. It’s a useful piece of kit, with high levels of accuracy and the ability to alter the angle of the cut. Offering adjustments from 0 to 45 degrees, a movable base, and fast blade changes, a Ryobi sliding mitre saw is easy to operate. It’s also convenient due to its compact size, making it perfect for bench and table-top use. But its compactness has no effect on its power output, with saws that rotate at up to 4,500rpm. Here at SGS, we have a collection of Ryobi cordless mitre saws available. Without a cord, they offer portability and convenience. Although you may expect a battery powered tool to quickly run out of charge, the ONE+ range uses Ryobi’s lithium+ batteries. 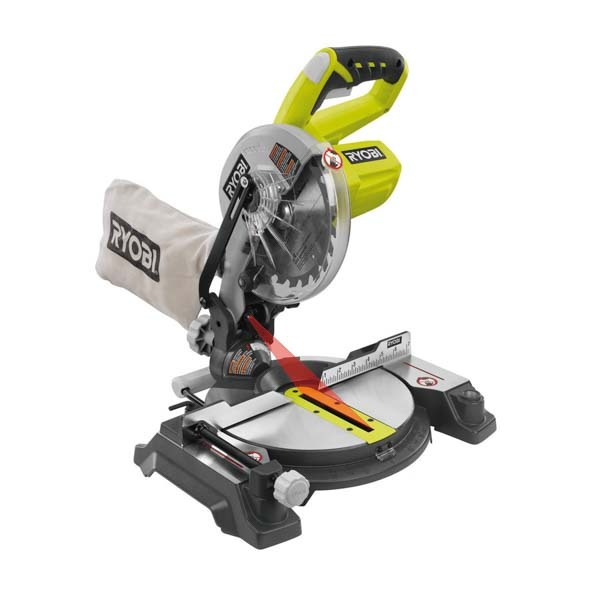 This can extend running time by 80%, allowing our Ryobi mitre saw range to complete up to 69 cuts in a single charge.